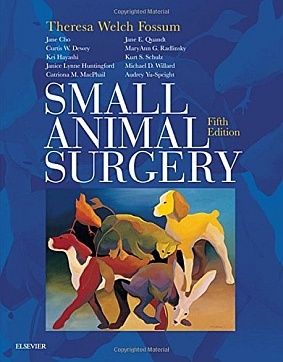 From basic procedures like spays, castrations, and declaws to advanced surgeries like craniotomy, vertal slots, and lung lobectomy, Fossum's Small Animal Surgery, 5th Edition is the go-to, full-color guide for everything that general veterinarians and vet students need to know about both soft tissue and orthopedic surgery. Five editors bring their expert perspective as they discuss the latest advances in key areas such as imaging modalities, regenerative medicine, minimally invasive surgery, and neurology. With each book adoption, you'll also have access to the Expert Consult website, which includes a fully searchable version of the book plus step-by-step video clips and animations of surgical procedures, aftercare instruction handouts, case presentations, references linked to full text articles on PubMed, and an extensive image collection. There is no better resource to keep you up to date on the latest advances and techniques in small animal surgery! ・NEW! Expanded sections on thoracoscopy, arthroscopy, and laparoscopy reflect the significant growth in minimally invasive procedures in vet medicine. ・NEW! Significantly revised section on joint disease includes additional techniques and procedures. ・NEW! Revised chapter on regenerative medicine emphasizes application of stem cell and regenerative medicine technologies to clinical patients. ・NEW! Increased emphasis on differential diagnosis helps you learn how to avoid misdiagnoses that result in unnecessary surgery with the inclusion of boxes covering disorders that may mimic the more commonly encountered surgical neurologic problems that are not actual disorders requiring surgical repair. ・NEW! Correlation boxes highlight the advances in veterinary medicine that correlate with human medicine. ・NEW! Expanded chapter on neurologic examination cover how to perform a proper neurologic exam to detect problems in cats and dogs. ・NEW! Step-by-step procedure videos that walk through both basic and advanced procedures have been added to this new edition. ・NEW! Aftercare instructions and rarely performed procedures have been added to the Expert Consult. ・Well illustrated, step-by-step instructions for surgical techniques provide quick reference to practical how-to information in emergency and clinical situations. ・Anesthesia Protocols offer easy access to recommendations for anesthetizing animals with particular diseases or disorders. ・Coverage of cutting-edge imaging techniques, including radiographs, CT, MRI, and digital imaging, explores the most useful imaging modalities for demonstrating areas of surgical concern. ・Clinical tips boxes provide at-a-glance surgical and practice tips. ・Postsurgical care instructions provide customizable client aftercare handouts for many of the procedures in the book. ・Reference links to PubMed grant access to full-text articles.